The Sam Houston Writing Center will give student, faculty and community writers a forum for their words to be heard during a new series of informal, after-hours readings. “Designed to be an encouraging forum for those who want to share their creative works with others,” the first “Writing @ the Center” reading will be held on Sunday (April 20), at 8 p.m. at the Writing Center, according Dana Allen, Writing Center consultant and English graduate assistant. “We chose the theme, ‘Your Words. Let Them Be Heard,’ because we want to give all types of writers the chance to speak out and share their writing with others who appreciate language and how it is used creatively to communicate our thoughts, feelings, and experiences,” Allen said. The event is open to anyone who is interested in reading or supporting the writing efforts of others. The next “Writing @ the Center” will be held on May 4. Door prizes will be given, and coffee and refreshments will be served. The Writing Center is located in Farrington Building Room 111. For more information, call the Sam Houston Writing Center at 936.294.3680 or e-mail wctr@shsu.edu. SHSU and the Student Activities department will recognize more than 21 organizations and students for their contributions to the community and for their leadership abilities during the 14th Annual Sammy Awards on Wednesday (April 16). Emceed by sophomore Daniel Pawlowski and Multicultural and International Student Services program coordinator Ashley McDonough, the event will include performances by SHSU’s theatre and dance department, the SHSU Opera Workshop, and "Artistry in Rhythm," a student jazz vocal group. SHSU will also bestow an honorary Sammy Award, its first, to State Rep. Lois Kolkhorst. “It was decided by the Sammys Committee that because of her continued support of the university, especially with the name change, that she was more than deserving of the award,” Cooper said. For more information, visit the 14th Annual Sammy Awards Web site at http://www.shsu.edu/~slo_sad/sammys/ or call 936.294.3861. Six professors from across the country will discuss various mathematical-related topics, including logic and computer science, during an "Algebra Mini-Conference" on Friday (April 18). Texas A&M University’s Zoran Sunik is scheduled to begin the one-hour, “higher-level scientific” lectures at 9 a.m., according to associate professor of mathematics John Snow. Other lectures will include University of Dallas’ Jeremy Alm at 10 a.m., New Mexico State University’s Elbert Walker at 11 a.m., Rice’s Moshe Vardi at 2 p.m., Cal Tech’s Jonathan Farley at 3:30 p.m. and Vanderbilt’s Ralph McKenzie at 4:30 p.m. While the majority of the talks “will be more advanced and directed toward a graduate student and faculty level,” the 2 p.m. discussion, "And logic begat computer science" is “designed specifically for an undergraduate audience,” Snow said. All are open to the public and will be held in Lee Drain Building Room 402. For more information, contact Snow at jsnow@shsu.edu or call the mathematics department at 936.294.1564. 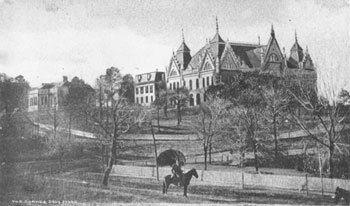 This photo of Old Main is one of the pictures from Huntsville's past that will be on display in the "University Corridor" exhibit through April 25 in the Lowman Student Center Gallery. The Political Science Junior Fellows and Huntsville Main Street are showing the “past, present and future” of the city with an art exhibit in the Lowman Student Center Gallery. “University Corridor: Past, Present and Future” features more than 100 historic photographs, dozens of contemporary photographs specially commissioned for this project and several renderings of future possibilities for the area between downtown Huntsville and SHSU, according to junior fellows adviser and political science visiting professor Mike Yawn. The “corridor” is an ideal focal point because it “is Huntsville’s street,” said Huntsville Main Street director Harold Hutcheson. The exhibit’s photos date back to 1863 and include such landmarks as the Walker County Courthouse; the district attorney’s office; Rather Park; Old Main; and the Rogers-Baird home, the oldest extant dwelling in Huntsville; the Wynne Home; Gibbs-Powell Home; Sam Houston Memorial Museum; and City Hall. Local photographers Melody Gathright and Dena Shipley contributed to the exhibit by donating “their time and talents and were wonderful assets to the project,” Yawn said. Another part of the city’s “past, present and future,” Huntsville’s nine living mayors, will be in attendance at the exhibit’s reception on Monday (April 14), from 5:30-7 p.m. in the gallery. The exhibit will run through April 25. More than 70 composers throughout the country will be represented and on campus this week for the School of Music’s 46th annual Contemporary Music Festival. Kicking off Wednesday (April 16), the four-day festival will include David Dzubay as the featured guest composer and SHSU’s Percussion Ensemble as the featured performing group. The festival will also feature a number of guest lecturers, and SHSU ensembles and professors will perform “both new and commissioned works,” including those by both SHSU faculty members and students, throughout the day on all four days, according to festival co-coordinator Trent Hanna. “All the music for this event has been composed by living American composers who will be in attendance at the Contemporary Music Festival,” said Randy Adams, assistant professor of trumpet, whose Faculty Brass Quintet will perform on Wednesday at 2:30 p.m. in the Recital Hall. Other CMF performances include an Organ Recital by Jay Whatley, Sax Quartet, Wind Ensemble, the Concert Choir, Women's Chorus and Flute Choir, as well as student groups Raven Brass and Intersection, among others. A complete schedule of events can be found online at http://www.shsu.edu/~music/events/contemporary.php. In addition to the CMF, SHSU’s Symphonic Band will perform a number of works for a band on Tuesday (April 15). The concert, at 7:30 p.m. in the Killinger Auditorium, will feature such works at Sam Hazo’s “Diamond Fanfare,” Camille Saint-Saëns’ “Pas Redouble” and Robert Jager’s “Variations on a Theme of Robert Schumann,” among others, according to Alfredo Vélez, assistant professor of music and symphonic band director. Other non-CMF-affiliated concerts for the week include a violin and viola studio recital on Tuesday (April 15) at 7:30 p.m. in the Recital Hall. These findings were announced during AERA’s meeting in New York at the end of March. “Mixed methods research: A research paradigm whose time has come,” a 2004 article co-authored by Burke Johnson and published in the “Educational Researcher” journal, was found to be the most downloaded article from December 2006 to December 2007. “Students’ perceptions of characteristics of effective college teachers: A validity study of a teaching evaluation form using a mixed methods analysis,” a 2007 article published in the “American Educational Research Journal” was the most downloaded article from April 2007 to January 2008. In addition, two of Onwuegbuzie’s other research articles were found to be the top downloaded articles for the journals in which they were published. “The exciting aspect of this is that it shows that mixed research has become popularized,” he said. Onwuegbuzie came to SHSU in August 2007 from Florida International University. Career Services will give students all the job-related basics with three workshops beginning on Tuesday (April 15). The Job Offer Evaluation and Salary Negotiation workshop will be held from noon to 1 p.m.
On Wednesday (April 16), Career Services will cover “the critical first year experience as a new employee” with the “From Student To Professional Workshop,” from 3:30-4:30 p.m.
“We will define what it means to be a professional, identify the key skills that employers look for, and discuss specific steps to attain first year success on the job,” Phelps said. Finally, the department will continue to cover the definition of “professionalism,” while also showing students and alumni “how to best handle common, but difficult, workplace issues,” on Thursday (April 17). The “Business Etiquette” workshop will be held from noon to 1 p.m.
All workshops will be held in the Career Services Library, and participants are encouraged to bring their lunches for both noon events.